If you have never been to the Falkland Islands to photograph penguins and other species such as Elephant seals and Sea Lions, it is difficult to explain in words what a natural wonderland the Falklands are. You really have to experience it to believe it. Most of the wildlife, notably with the exception of Black-necked Swans, is unafraid of human presence and will often sit right down beside you out of curiosity. While at Volunteer Point on East Stanley we sat amongst King Penguins and their chicks while they went about their business seemingly oblivious to our presence. I had one young King lay down 2 feet from me and fall asleep! It was a similar experience with the 3 other common species of penguins on the Falklands, Gentoos, Rockhoppers and Magellenics. While sitting outside their colonies they would go about their life coming and going from the ocean and switching nesting duties with their partners while fending off intrusive neighbors and feeding their young. At one point I was surrounded by a dozen Rockhopper penguins while they picked at my boots and slept in the surrounding grasses. One of the best experiences for me was watching the Gentoo penguins swimming into shore in small groups and springing out of the water onto the beach to begin their walk back to the colony along one of the many penguin highways as they are called by locals. You could watch them porpoising in from sea about 100 yards out right until they reach the breaking surf, looks like they are having fun but it just could be that they are in a hurry. Either way it was so cool to witness this behavior. 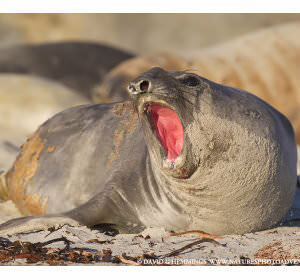 Then there are the colonies of Elephant seals on the beaches at Sea Lion Island. There you can see and photograph up close 3 week old calves and young males practicing their fighting skills to prepare for when it is time to find mates. The noises these seals make are loud and impressive as they voice their opinions to the other individuals in the colony. Then there are the Striated Caracaras. These beautiful falcons nest and breed in the outlying islands of the Falklands are very photographable, sometimes very up close. 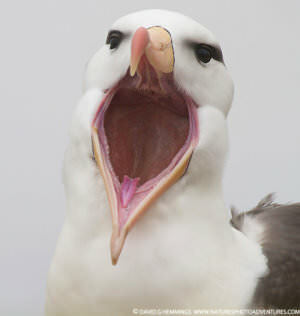 Then there is the majestic Black-browed Albatross. There are a few colonies that are accessible to humans and the photo opportunities are unbelievable. To watch these beautiful seabirds coming and going from their nests and doing greeting displays is something that you really need to see once in your life. Sometimes I just watched in amazement and forgot that I was there to take pictures! Throw into the mix an abundance of other species such as Snowy Sheathbills, Upland Geese, Kelp Geese, Cobb’s Wren, Long tailed Meadowlark, Crested Ducks, and Silvery Grebes and you have a place with so much to offer the bird and nature photographer. The hosts on the different islands are just so hospitable and knowledgeable that they add a lot to the Falkland experience. The accommodations are basic to good but there is always a friendly smile, good food and all of your basic needs are met. I can’t tell you in this short article what it is really like in the Falklands, you just have to experience it for yourself!